Niko Bellic, Michael Keane and Patrick and Derrick McReary arrive outside the bank. Three Leaf Clover is the third and final mission offered by Patrick McReary in Grand Theft Auto IV. Niko drives the group to the Bank of Liberty branch on Columbus Ave which is located in The Exchange, Algonquin. They rob the bank of $1 million and make their escape through the streets and subways of Chinatown, Algonquin. Packie is proud that he and his gang, including Niko, kept their heads and managed to get the money to split between themselves. Niko is awarded $250,000 at the end of the mission (which makes day to day purchases such as weapons, food and clothing no longer a concern for the remainder of the game, despite Niko continuing to cite earning money as a motivation in later missions). Following successful completion of this mission, Gerald McReary will call Niko and ask to see him in Dukes, followed by Packie's request that you help Derrick out in Alderney. The terrorist threat separating both sides of the West River is lifted subsequent to completion of this mission, opening up the Booth Tunnel and Hickey Bridge. Niko is able to travel to Alderney legally, with the entire map now open to the player. Note that the game does not announce that Alderney is open (unlike the opening of Algonquin which was made evident during the course of a mission); the only clues are the appearances of service icons on the map, and Packie eventually calls asking Niko to meet up with his brother, Derek, at an Alderney location. This will also unlock the Full Exploration achievement on the Xbox 360 or PC version. Or, if the PlayStation 3 version is being played, the player gets a trophy, Full Exploration. Shortly after this mission Packie will call Niko and be added as a friend. The balaclava is now available in your wardrobe. The outfits Niko and the group wears during this mission (suits with balaclavas), the weapons used (AR-15s), the large black bags of money slung over each robber's back and the general set-up of the mission is an obvious homage to the 1995 film Heat, in which Robert De Niro and his henchmen rob a bank in similar fashion, including a subsequent run-and-gun shootout in the surrounding city streets of Downtown L.A. In both heists a member of the gang named Michael dies. The mission also references the 1991 film Point Break; during a bank robbery in that movie, one of the hostages (a plain-clothes police officer, as opposed to a gun club member in the game) decides to take down the robbers, succeeding in killing one of the crooks but ultimately leading to their own death. In both the movie and the game, the would-be hero also discusses their plan with a neighboring hostage, a security guard in Point Break, Luis Fernando Lopez in GTA IV. A further reference is to to the Grand Theft Auto: Vice City mission The Job, in which the main character robs a bank in Little Havana, Vice City, with a four-man crew (including Phil Cassidy, Cam Jones, Hilary King, and himself) and one of the members dies. Furthermore, if the player takes too long targeting the first two police officers in the subway, they will kill one accomplice and the player will fail the mission. The same thing happens in The Job when Tommy Vercetti is on his way to the safe; if the player fails to eliminate the two PIGs on the second floor quickly enough, they will kill Cam, leading to mission failure. 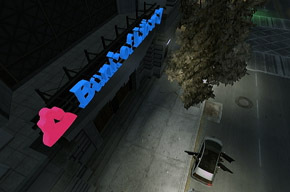 The five star wanted level that the player gains after the robbery is permanent until it is reduced near the end of the mission, it can not be removed even with cheats or fleeing the borough. If you kill the pilot of the Annihilator that corners you, it will explode instantly despite being very low over the ground. This is likely just to prevent the player from obtaining it early, however. If you call Roman after completing this mission, Roman will talk to Niko about the robbery and say it's a shame that Niko wasn't involved. Niko tells him that maybe he was, to Roman's shock and disbelief. The mission's name is a reference to the fact that, in Ireland, four leaf clovers are considered lucky. There are four members of the heist gang, although unluckily Michael is killed, leaving just three. Reception of this mission by fans has shown that these types of missions are very popular; many people cite it as their favorite in the game. In the PS3 version, after the cutscene where Eugene Reaper is shot, if the player exams the floor by Luis Lopez they can see that Eugene is still alive with his hands on his head; instead, there is a dead fat bearded man beside them. It is possible to kill Luis before escaping the bank, which would logically make the events in TBOGT impossible. Moreover, the player receives no penalty for doing so. However, Luis can still be seen in The Libertonian taking over the diamonds, which causes a violation between the storylines. According to the TBoGT introduction video, Niko picked a gray suit for the heist, not black with red or pink tie, which would mean it was Niko's choice of suit for the game. When Luis leaves the bank after it's robbed in the introduction of TBoGT Niko, Packie, and Derrick are seen almost running over Luis in the crosswalk, this does not at all happen in the original GTA IV. Even if the player goes to the exact same spot Luis will not be spotted. In TBoGT you discover that Packie spent his share of the money from the heist on a red Comet. Each of the four members of the bank heist team are armed with different weapons, which makes it easy to identify them: Packie is armed with a Pump Action Shotgun, Derrick is armed with a Pistol while Michael and Niko are armed with Carbine rifles. Michael is the only member of the bank heist team that doesn't use his weapon, as he was killed by Eugene Reaper before he had a chance to use it. Strangely, for some strange reason, shooting the money in the safe results in mission failure. This is probably because shooting the money damages it and renders it unusable. During the cutscene when cornered by the Annihilator, if the player equips the rocket launcher they will fire on the helicopter with it. Niko will fire three shots. The first two will miss but the third one will hit but for some apparent reason the helicopter is intact and continues flying. If the player goes back to the bank after losing their wanted level, the police and everyone else will be gone. Only Luis will remain on the bank's floor. If the player kills Luis, he/ she will get a 2 star wanted level and the police will magically reappear at the front of the bank. Oddly, your team mates will not shoot at them and they will still shoot at you even if you lost your wanted level. Sometimes when the player returns to the bank the alarm will not ring and everyone is standing up normally as if nothing had happened, including Eugene Reaper who was shot dead. Halfway in the shootout in Chinatown an ambulance can be seen trying to get past a police roadblock into the scene. Niko, Packie and Derrick threatening the hostages. Niko killing Luis Fernando Lopez. LCPD and NOOSE officers surround the building. The police being shot at by Niko. Niko shooting a police car. Niko, Packie and Derrick attempting to evade the police. A Weazel News report showing Niko Bellic in the banks vault. This page was last modified on 25 May 2015, at 22:50.